The fallout of Rockstar’s Red Dead Redemption 2 is still incinerating the minds of awe-struck fans, the gaming horizon dominated by the colossal mushroom cloud made up of roiling tumbleweeds. The game’s acute attention to detail has broken the earth with its milestone; the gap an impasse that will have other developers building bridges to cross for years to come. Having said that, let’s be greedy for a second and look to what else could be in store for us. Let’s just acknowledge that a lot of us really want another iteration of Undead Nightmare, the loving ode to classic horror that served as Red Dead Redemption’s first single-player expansion. Rockstar has created the perfect canvas for a horrific masterpiece, and I’m praying that they smear the ever-loving hell out of it with zombie brains. There might also be a case for alien brains, while we’re at it, but hush now. Let me guide you on this wishful desire to see a masterful open-world horror, once more. Spoilers for Undead Nightmare ahead. In Undead Nightmare, tragedy struck John Marston on his homestead, leading to the zombification of his wife, Abigail, and his son, Jack. After tying them up, he sets out on a quest to find a way to reverse their flesh-eating affliction. Despite being satirical, you could argue there was a clear emotional drive for Marston to complete his goal, a drive that waded through an evolving mystery that showcased a wonderful version of established characters. Like Undead Nightmare, there are people for Arthur Morgan to care about. Twenty-two, to be precise. Arthur and his gang could still be yearning for their freedom. It’s through troubles made by the lovable misfits in their own activities outside of camp that would draw Arthur further into the heart of the landscape’s newfound horrors. RDR2’s heavy focus on exploration and discovery would compliment whatever twisted road Dutch’s gang found themselves fumbling through. John Marston discovered an Aztec mask to be the culprit behind his zombie infestation, but only after following up on leads that suggested very differently. Witchcraft, divine retribution, cultists, and government experimentation could easily drive a compelling narrative, each point of interest driving Morgan to discover that it’s actually extraterrestrials to blame for the infection. Imagine the build-up as you head out West, where you discover the remains of a functioning mothership towering from the ground where Tumbleweed once was in New Austin. Seeing your ragged Arthur toting a revolver through the pristine technological horrors of another species would be insanely gratifying. “You’re all right, boyyyyyy,” a broken Arthur continuously murmurs to himself, mowing down the other-worldly beings that abducted and butchered his horse. There are some frightening moments in RDR2, already. I won’t spoil them for those that have yet to discover the game’s creepier undertones, but they do exist. My skin crawled plenty of times, and this is RDR2 without a world built for unnatural horror. If the game’s engine was utilized to create a hellscape of blood-red sunsets and morose skies where chaos reigns in biblical proportions, there would be little comfort in venturing out into the wilds, and any game that fills you with a sense of dread just by traveling is doing a damn good job. Hearing something drag itself towards you at night is a cool thing, I promise. It would be interesting to see Rockstar discard the raging marathon sprinting zombies in favor of slow ones, specifically because I think they’re ready to handle hordes. Their open vistas are already a sight to behold, but I’m constantly imagining coming across a mutilated, decaying mass of brain-slurpers. I think it could be cool if your wanted level is noise based. Too much gunfire and you’ll attract enough zombies in your area to create a ceaseless, slow-moving meat grinder with you in its sights. We were treated to Sasquatch and the four horses of the Apocalypse in Undead Nightmare, as well as other fun creatures that dwell in myth. Besides the inevitable undead animals, it would be fun for those Legendary hunts in RDR2 to focus on bigger American myths. I would love to go after the Mothman at some stage, or navigate the bayous of Saint Denis to find the Honey Island Swamp monster, endeavors that require both ample preparation and a decent bit of courage. What’s an open-world Rockstar game without factions? As I said earlier, there could be the likes of zombie-worshipping cultists, Pagan witches hoping to create powerful elixirs from undead flesh, a shattered resistance trying to rebuild society, a school of morally questionable inventors climbing the ladders of chaos in the name of science, and shady government officials that know more than they let on. Each faction’s purpose comes in direct conflict with one another, which makes possible some great random encounters throughout the world. Are you telling me you don’t want to see a cultist excitedly basting himself in blood like a turkey to be a snack for the undead, so they too can join the collective? What about finding a laboratory where some sadistic body snatcher is trying to create super humans with zombie blood? 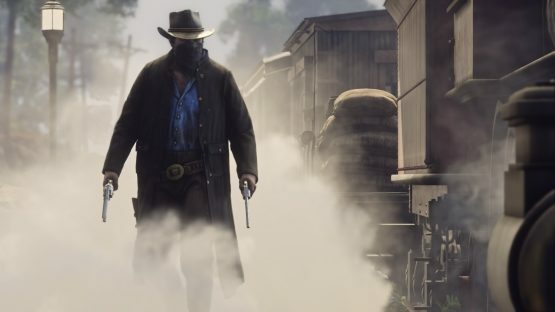 Each of these factions could offer you thematically appropriate items, weapons, and clothes as you interact with them, so it wouldn’t be too crazy to see Arthur Morgan toting a steampunk-esque set of armor and clothes while drinking supernatural elixirs and firing the strange, light-based weapon a cultist found out West. I think this would be the meat and potatoes of whatever sub-genre of horror Rockstar decided to use. Fortifying your camp against outside evils would be an interesting feature, just as long as it’s as lenient as camp upkeep remained in the original campaign. Fortifications could offer aesthetic changes and other quality of life boosts, but wouldn’t be a necessity. Roaming the blood soaked plains would be quite the chore if that was the case. However, given Rockstar’s affinity for maintaining a somewhat realistic method of survival in RDR2, what if there was an optional survivor mode? Unlocked after you’ve completed the campaign, you’d have the option to initiate a survival campaign, the likes of which would give other survival titles an identity crisis. You have not one, but twenty-two other lives to look out for as you navigate the wilds. This is where fortifications do indeed matter, because each death would be permanent. Imagine Sean suffering a bite from the infected, giving you a time limit to find or craft a cure before he becomes another mindless husk for you to exterminate. His ravings might actually be worth the trouble, but let’s look out for our fellow Irish, eh? It goes without saying that your own death means you’ve gotta pack it in, partner. But, in typical rogue-like titles, it’s customary to reward the player for making it to certain parts of a game. 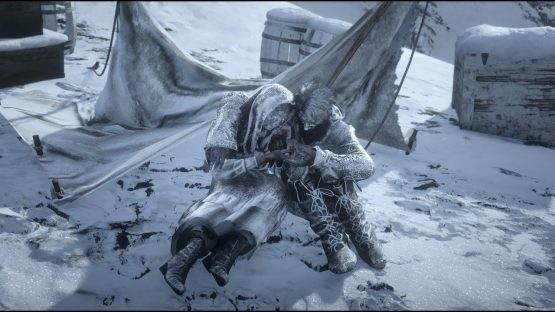 RDR2 could bestow perks and items for both characters and the camp itself for making it through a certain number of days, making your next attempt at survival somewhat more advantageous. It could also be possible to fortify wagons as you and your gang set up to find new camp locations, some of which might not have been featured in the original campaign. The incentive to move could be a scattering of both needed supplies and weapon caches. Guns would have to be distributed accordingly, otherwise camp members are stuck using blunt objects to fend off approaching dangers. I don’t believe any of this to be too ambitious for Rockstar. If anything, they’d probably look to my guesswork and say, “Aw, that’s cute,” before whipping out an experience that tops expectations of all. Regardless of what I want, I just hope we see some form of genre-bending from Rockstar that manipulates the extravagant world they’ve created. But I’d like to hear from other people on this. Do you want zombies again, or something different? What features do you think would make a good addition in potential DLCs? Let me know in the comments.